“C.O.G.” is based on Sedaris’ experiences in his late 20s when he went to go work as an apple picker in the orchards of Oregon. Once there he found himself at odds with the locals and the religious right. Among them: Curly, a factory worker with nefarious intentions; Hobbs, the curmudgeonly farm owner; and Jon, a one-legged veteran evangelist who takes David under his wing. So Alvarez decided to go one of Sedaris’ book readings and give him a copy of “Easier Than Practice.” A few months later, Sedaris wrote him an e-mail saying that he liked the movie and was interested in why Alvarez wanted to turn “C.O.G.” into a movie. Alvarez — who admittedly has idolized Sedaris for years — spent all night writing him back with a six-page e-mail. “He ending up saying yes, and he’s been incredibly gracious and supportive ever since,” Alvarez gushed. That may seem surprising given Sedaris’ rather adamant refusal to allow his work to be adapted for film in the past. 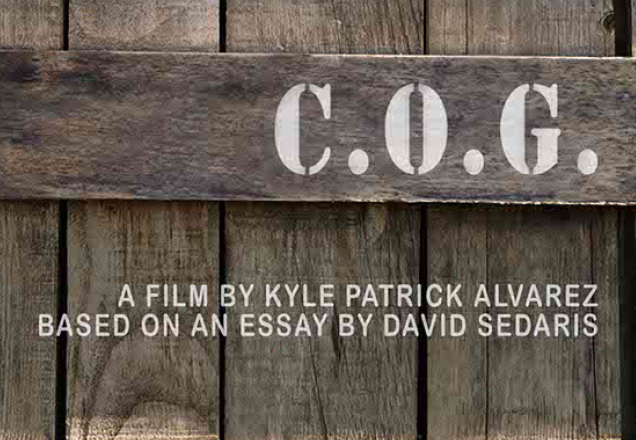 But as Alvarez explains, there’s a simple element to “C.O.G.” that makes it an exception to Sedaris’ rule. The story does, like most of his work, include Sedaris himself as a main character. Alvarez said he’s being extremely cautious to avoid trying to simply impersonate him in the film. Sedaris has been meeting with Alvarez whenever he comes through Los Angeles and discussing the director’s process so far. Shooting on the film begins in October, and Alvarez and his team (which includes producers Cookie Carosella and Stephen Nemeth) are going to start casting soon. Alvarez said he expects to complete the film in the first quarter of 2013, so Sedaris fans can likely expect their first glimpse at his work on screen sometime later that year.